The symbols and insignia of Sigma Kappa are outward signs of the special feeling we have for each other that comes from within ourselves. As a member of Sigma Kappa you are obligated to uphold her high standards and ideals, remembering that Sigma Kappas all over the country are bound by the same tenets. Louise Helen Coburn's early reminiscences give us her memory of white as the color favored in the early days of Sigma Kappa. She said that lavender and maroon, as our colors, occur in the minutes of June 1891. They were being used then and apparently had been approved earlier. A note in the minutes of 1904 speaks of a committee appointed to "write down the true significance" of our colors which is revealed in the ceremony of initiation. Violets were loved by all Sigma Kappas from the beginning. The delicate flowers grew wild along the banks of the Messalonskee River where the founders sat and dreamed of Sigma Kappa. In June 1892,the violet was adopted as our national flower. The flower was thought to belong to the days of promise as is Sigma Kappa. The pearl is the official jewel of Sigma Kappa and was adopted at the Sigma Kappa Convention in 1915. The pearl is recognized as a symbol of purity and gracious character. The dove was accepted as an official symbol of Sigma Kappa at the 1984 convention and the heart was adopted at the 1988 convention. Both symbols signify the love felt by members across the country. The earliest badge design was what is now used as our pledge pin. On March 7, 1894, the triangle badge was chosen with "unjeweled maroon enamel, if possible." Jeweled badges were approved at the 1915 convention when the pearl was adopted as our national jewel. Unjeweled badges have a scroll edge. The badge is worn over the heart proudly by members of Sigma Kappa to indicate membership. The pledge pin is a gold Greek letter S shaped like a serpent intertwined through a K. In 1920 this design was officially adopted as our pledge pin. The pledge pin is also worn over the heart by new members of Sigma Kappa. Once initiated, the pin is surrendered to the chapter for their new badge. 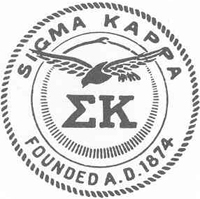 The seal of Sigma Kappa is used on all official papers, membership certificates and chapter charters. The official coat-of-arms was adopted by Sigma Kappa in1911. It reflects the familiar symbols of the sorority - the dove, the violet, the Greek letters and maroon and lavender. Membership in Sigma Kappa extends beyond our college campuses. Our members belong to an organization which spans from coast to coast and is composed of women, both undergraduate and alumnae, who share the same purposes and principles. Membership in Sigma Kappa offers friendship, companionship, scholastic assistance, leadership opportunities, meaning in college associations, and a firm life foundation. It is Sigma Kappa's goal to help each member develop to her greatest potential. Offers a wellness program to ensure that each member is knowledgeable about social issues, physical well being, values and ethics, emotional development and academic achievement. Provides leadership in the complete elimination of hazing on campuses which host Sigma Kappa chapters. Discourages events which promote a low image of the Greek community. A high priority is the desire to maintain and expand efforts to provide a most satisfying educational experience for student members which will lay the foundation for the development of loyal alumnae to both the institution and to Sigma Kappa. The vision of Sigma Kappa is to be a premiere Sorority, forever achieving excellence in our chapters and among our members and positively influencing the lives of others. Sigma Kappa Sorority is a social organization of collegiate and alumnae women committed to promoting the ideals of lifelong friendship, intellectual and spiritual fulfillment and service for the greater good. The purpose of Sigma Kappa Sorority is to unite its members in a bond of sincere friendship for the development of character and the promotion of social, literary, and intellectual culture to support and further the program and objectives of the colleges where its chapters are functioning; to strive for high standards of acheivement-scholastically, socially, and spiritually and to make a constructive contribution to the communities in which its collegiate and alumnae clubs are located by encouraging the exercise of the rights and obligations of good citizens and the support of worthwhile civic, social, and philanthropic projects. Sigma Kappa Sorority was founded at Colby College in Waterville, Maine on November 9, 1874. Colby College was the first college in New England to admit women on an equal basis with male students. The first female student was admitted in 1871, and for two years Mary Caffrey Low was the only woman at Colby College. In 1873, four more young women from Maine, Elizabeth Gorham Hoag, Ida Fuller, Frances Mann and Louise Helen Coburn were admitted to Colby and the five young women found themselves together frequently. During the school year of 1873-74, the five young women decided to form a literary and social society. They were told by the college administration that they needed to present a constitution and bylaws with a petition requesting permission to form Sigma Kappa Sorority. Their purpose at the outset was that the sorority should become what it is now, a national organization of college women. On November 9, 1874 the five young women received a letter from the faculty approving their petition. Thus, this date has since been considered our Founder's Day. In our first constitution, chapter membership was limited to 25. The original group was known as the Alpha chapter and as our sorority grew, Beta chapter and Gamma chapter were also established at Colby College. Early records indicate that the groups met together. But in 1893, the Sigma Kappa members voted to fill Alpha chapter to the limit of 25 and to initiate no more into Beta and Gamma chapters. Eventually, the second and third chapters would vanish from Colby campus. Finally, Sigma Kappas realized if the organization was going to continue to grow, it had to expand beyond the walls of Colby College. In 1904, Delta chapter was installed at Boston University. Elydia Foss of Alpha chapter had transferred to Boston and met a group of women who refused to join any of the other groups on campus. Elydia took the necessary steps to make Sigma Kappa a national sorority and it was incorporated in the state of Maine on April 19, 1904. Their new status as a national sorority made Sigma Kappa eligible to join the National Panhellenic Conference. All website pages are unofficial.